My mother was a piano teacher and I grew up with people coming and going, learning, sounding both wonderful and not so wonderful. She had a pretty strict rule about kids being old enough to want to learn before she would take them on as students. I don’t know how old I was when she finally caved to my begging her to teach me but I still have the purple learning book I started with sometime around kindergarten. Mom has also filled in as organist and choir director so at points throughout the week, she herself would be playing at night different songs getting ready for church or helping Dad pick out the right songs for his upcoming sermon. It was all very Little House on the Prairie. Heh. As much as I loved hearing her play, I was more impressed by the way her hands would effortlessly move up and down the keys without even looking. My mom’s hands were cool. Useful. They made music. Her nails were always very short (nail biter, uck) but her hands were beautiful. I still remember the feel of them. Perhaps it was that beginning that made me notice people’s hands. My Grandma Peterson had beautiful hands. Long, thin with long fingers and perfectly sculptured nails that were almost always painted. I remember holding my hands up to hers. So much bigger, wider, almost man hands next to my dainty Grandma. I told her one day I wish I had her hands and in Grandma’s practical voice, she told me that I’m meant to have the hands I have and go put them to use. So I ran out and played ball with the neighbors. Grandma was smart. My Grandpa Peterson’s hands were like him. Shorter, stocky, strong. When Grandma’s Alzheimer’s got so bad that she had to be moved to the town nursing home, I would watch Grandpa hold and gently stroke Grandma’s hands and tell her stories of their 50+ years together. As if he could will the memories to reappear in Grandma’s mind. Their hands told a story. Frail and forgetful, held by strong but sad. When Grandma died and we were at the funeral home prior to the visitation, Grandpa came in the room and made a beeline for Grandma in her casket. The first thing he did is start stroking her hand, silently crying. It has been one of the most powerful visions of my life. Years later I still notice hands. I was awestruck in Enumclaw this summer when I saw elite thrower Kate Burton’s hands. They are spectacular (no, I didn’t tell her so. I thought that would pretty much put me in the weirdo zone for future throwing events;) They are strong and proportionately large, and when she throws it’s as if all the power in her body is shot through her hands to the implements. It was quite awesome. On the flip side, my Zandra has small hands. Really. Small. Hands. I have no idea where they came from. 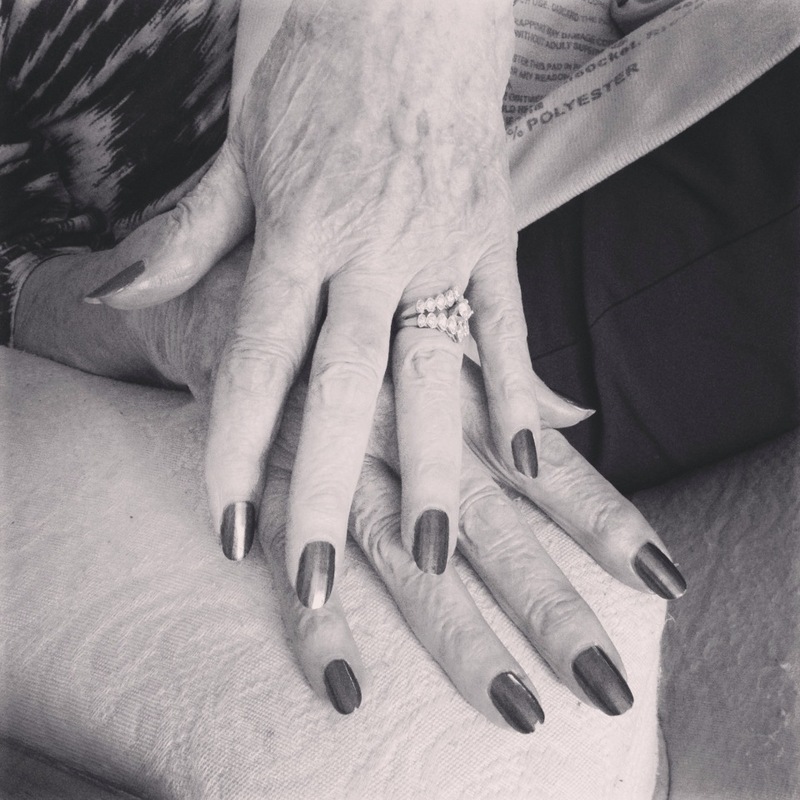 Her fingers are long and beautiful but overall, she her hands are even more dainty than my Grandma’s. In her goalie playing days, there were a few times when that glove would go flying and she would start pounding on whatever silly girl decided to try to take her out in her crease. I was amazed (and amused) that such anger and strength could come from those hands. Last spring I was over at Bigg’s folks house talking with his Buscia (grandma in Polish.) Buscia’s hands are long and beautiful like my grandmother’s but larger and stronger. They are always manicured and stunning. I, on the other hand, have my Tutu’s hands. My Hawaiian grandmother passed along her wide, average length fingers to me and I’ll take ’em. They’ve served me well and I’m thankful for them. The right one is feeling the stress of throwing all season and take a few fist pumps to get going in the morning, heh. My favorite hands obviously belong to my Bigg guy. Though much bigger than mine, they are shorter and wider which means he has to work double hard at the grip events for his sport and he just rolls with it. (Literally, he loves training the rolling thunder.) They are strong and useful and are usually reaching for my hand about 100 times a day. Behold the hands, how they promise, conjure, appeal, menace, pray, supplicate, refuse, beckon, interrogate, admire, confess, cringe, instruct, command, mock and what not besides, with a variation and multiplication of variation which makes the tongue envious. This entry was posted in Uncategorized and tagged alzheimers, Grandparents, Milwaukee Weightlifting, Strongman, tosabarbell. Bookmark the permalink.